What Are The Things Successful Crowdfunding Projects Do Right? Crowdfunding is a method of raising capital by tapping into a large pool of individuals, primarily online, via social media and crowdfunding platforms. Those who use this method usually leverage their networks for greater reach and exposure, promising rewards for those willing to put their money into such ventures. 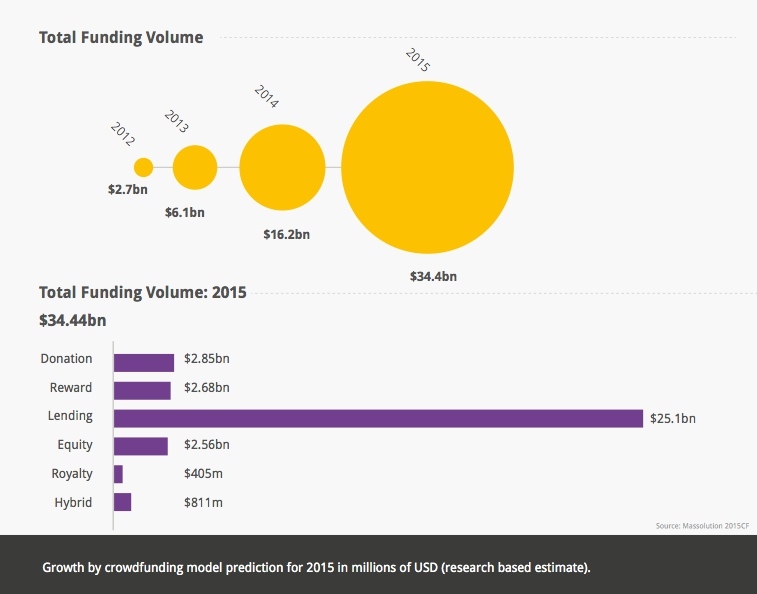 Crowdfunding has become big business, estimated to be collectively worth more than US$34 billion in 2015. However, it is still in its infancy, and its potential is yet to be felt especially in the developing world. Reach – By using a crowdfunding platforms, you have access to thousands of accredited investors who can see, interact with, and share your fundraising campaign. Presentation – By creating a crowdfunding campaign, you go through the invaluable process of looking at your business from the top level of its history, traction, offerings, addressable market, value proposition, and getting it down into a polished, easily digestible package. PR & Marketing – From launch to close, you can share and promote your campaign through social media, email newsletters, and other online marketing tactics. As you and other media outlets cover the progress of your fundraising, you can double down by steering traffic to your website and other company resources. Efficiency – One of the best things about online crowdfunding is its ability to centralize and streamline your fundraising efforts. By building a single, comprehensive profile to which you can funnel all your prospects and potential investors, you eliminate the need to pursue each of them individually. Instead of duplicating efforts by printing documents, compiling binders, and manually updating each one when there’s an update, you can present everything online in a much more accessible format, leaving you with more time to run your business instead of fundraising. While it would appear easy to approach people online with a fantastic idea that they can invest in, every step in the pitching process needs to be fine tuned to achieve your desired purpose. Timing: Early funding and backing is key to successful crowdfunding. The more backers and funding received in the first few days of a campaign, the more likely it is to succeed. This suggests that designing a campaign to reward the early backers will lead to it being more successful. Networks: Leveraging your large online social networks helps you achieve success when it comes to crowdfunding ideas. Projects tend to proposer when you add an online social network link to your project’s pages, this is a clear indication that you are intentionally using their social network in order to boost their crowdfunding campaigns. Impatience: Being impatient to get off the ground increases the probability of a project‘s success. This may seem counter-intuitive as one would expect that giving a campaign more time would help it succeed. But when it comes to crowdfunding, backers are impatient, they want to get the projects they support off the ground as soon as possible. In fact, they are so impatient that the shorter the declared duration of the campaign, the more likely the project is to succeed. Reputation: For a project to take as an entrepreneur who aims to have a successful campaign, it takes your reputation and trust. This experience improved the chances of a project’s success, as it increased the reputation of this creator generating trust. This is very important in an environment such as crowdfunding where the entrepreneur knows much more about the characteristics of the new product or service to be launched than the potential backers. Crowdfunding goes against one of the primary approaches to financing a business. Conventional wisdom states that if you want to raise capital to start a business or launch a new product, you need to have the capital ready, along with your business plan, backed by market research. With this in hand, you would then shop your idea around to a limited pool or wealthy individuals or institutions – banks, angel investors, and venture capital firms. This fundraising approach can be thought of as a funnel, with you and your pitch at the wide end and your audience of investors at the closed end. Fail to point that funnel at the right investor or firm at the right time, and that’s your time and money lost. Numerous sites such as Kickstarter and GoFundMe have emerged to meet the demand, driving up the overall level of investment in ideas that need to move beyond the concept phase. Crowdfunding draws a crowd: investors and other interested observers who follow the progress, or lack of progress, of a project. It allows good, often unconventional, ideas, to attract financing through the wisdom of the crowd. This way, enterprises can secure seed funding, meaning that ideas that would not otherwise see the light of day get a chance to shine.